Owen Russell knew he had a problem when the smell hit him. Russell, the superintendent at Markland Woods in Etobicoke, Ont. for the past eight years, ventured out on his course in February, worried about the impact of ice and cold on his club’s greens. Like many superintendents concerned about how the coldest winter in the last three decades would affect his course, Russell drilled through the ice to see what was happening with the grass underneath. What Russell smelled was dead Poa annua grass, the most common grass found on older golf courses throughout North America. The grass is known to struggle if under ice for extended periods of time. In the case of many Ontario courses, ice encased golf course greens for more than three months, twice what most Poa grasses can withstand. By the time Markland Woods’ greens were clear, Russell recognized the extent of the damage brought by the extreme cold. On most greens at least 50% of the grass was damaged or dead, and that amount rose to more than 70% on other greens. What Markland Woods experienced is now being felt across Ontario courses where Poa is the covering for their greens. The damage to golf courses is widespread not only in Ontario, but across the northern U.S. as well. 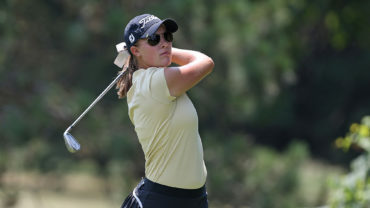 In Ontario some of the best-known golf courses—from host courses of the RBC Canadian Open like St. George’s to Hamilton Golf and Country Club through to modest public courses like Guelph’s Victoria Park East—have been hit by extensive damage. The cold, it turns out, doesn’t discriminate based on the cost of the green fee—it killed Poa greens regardless. The problems facing golf courses with Poa greens have different names, but the result is the same. 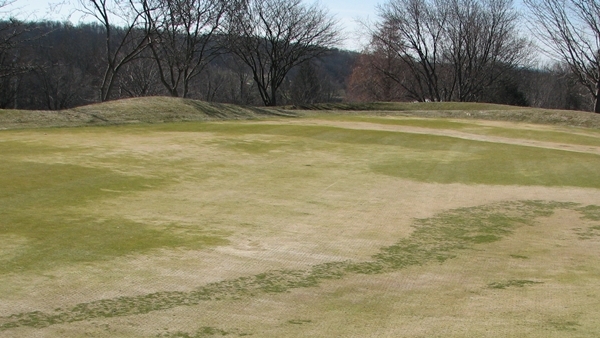 Hit hard by a the coldest winter in years, Poa grasses were damaged by crown hydration, whereby grass takes in water and is hit by a sudden freeze; winter desiccation, which is essentially dehydration due to constant exposure to exposed, higher areas; depleted oxygen by anoxia; low temperatures; and ice. In some instances, superintendents say they were hit by all four problems, something that has never occurred before. Ackermann used Ackermann used a combination of permeable and impermeable tarps on many of his greens to protect them from water and ice damage. But this year the tarps weren’t enough, and water managed to find its way to the grass anyway, leaving the club with seven temporary greens. Now Ontario superintendents face decisions on how to deal with the difficult hand Mother Nature has dealt them. Do they reseed the greens with a strain of bent grass that will be more resilient to Ontario’s harsh winters, or do they try to grow Poa and reestablish it in the hope they don’t face a recurrence of the stunning cold? Keith Bartlett, superintendent at St. George’s, has problems with Poa damage on most of the club’s greens, though he hopes to have most of the greens open by mid-June. Bartlett, who has worked as a superintendent for 22 years, says bent grass is the only true solution to the possibility of winter damage in Ontario. He adds that bent grasses take less water, fewer fertilizers, and create a better playing surface. Trainor has been promoting a move to bent grass at Hamilton, which hosted the 2012 RBC Canadian Open, for some time. He was starting to feel optimistic about the chances of making the change when the club hired a new golf architect, Martin Ebert, and was hopeful the club might move that way when he put the historic course to bed in December. A late rain later that month, followed by intense cold, left him worried about what would happen in the spring. 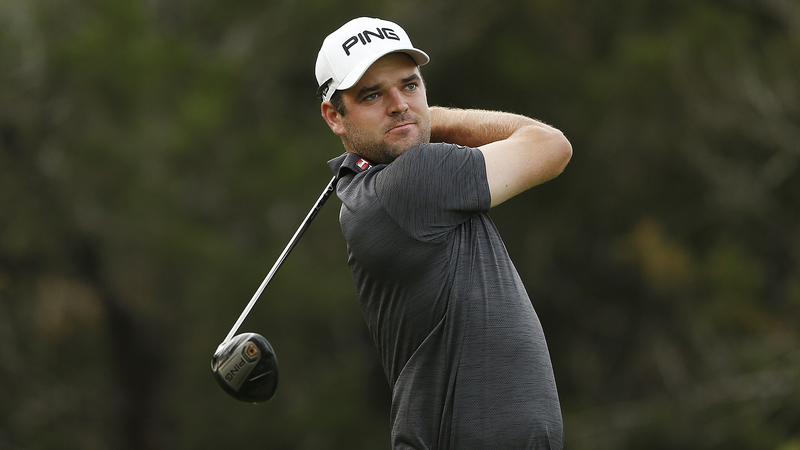 Ian McQueen knew he had an issue when he took a sample from one of his greens in February. The superintendent at Islington Golf and Country Club in Toronto, a course designed by the legendary Stanley Thompson, McQueen struggled to even get a sample from the frozen ground. As is typical for superintendents, he brought the sample indoors and attempted to restart the grass . . . only his sample wouldn’t grow. All that remained was for McQueen to wait two more months for the snow and ice to clear and find the extent of the damage. He found between 60 and 95% of the grass on Islington’s greens dead. McQueen is suggesting having Islington not only plant bent grass, but completely rebuild the club’s greens with new strains of bent grass that keep Poa from taking hold. It is an ambitious project, but one that will limit future spring damage, he says. Like McQueen, David DeCorso has tough decisions to make. DeCorso is the superintendent at Victoria Park East, a 40-year old public course in Guelph. The course, like many of its age, has Poa greens, many of which have varying levels of damage from the ice and cold. Victoria Park East is owned by the DeCorso family, as is a newer course, Victoria Park Valley. The new course, with its bent grass greens, had no issues from the winter, but on the east course DeCorso has opened the season with three greens closed, and nine with tarps covering large sections as he attempts to grow grass. Closing the course to reseed with bent grass or sod the damaged greens isn’t financially viable, he explains, especially in a market where the long winter has already cut into paid rounds. DeCorso says many golfers have shrugged off this year’s problem as typical of Ontario courses during a long winter. But the situation is much more severe than other years, he points out, and he wonders if golfers will feel so charitable if public courses don’t recover by June. At Markland Woods, Russell is preparing his course for incoming sod. The superintendent and the club have elected to make a drastic move and sod all of the club’s greens with bent grass that wasn’t used in another golf course construction project. There’s not enough bent grass sod to go around for other clubs to follow suit, but Russell is convinced it will resolve Markland’s issues with winter and Poa grasses for the foreseeable future. Veteran golf journalist Robert Thompson is Senior Writer at SCOREGolf magazine, edits the PGA of Canada’s publications and is the golf analyst for Global News.